The stomach rumbles, your hungry, you have sudden cravings for a specific dish. 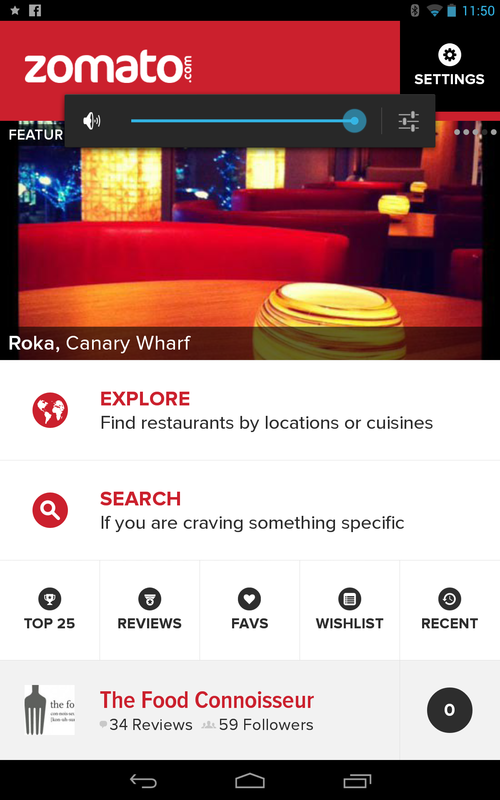 This is where Zomato comes in, Zomato is a restaurant finder for wherever ticks your mood. 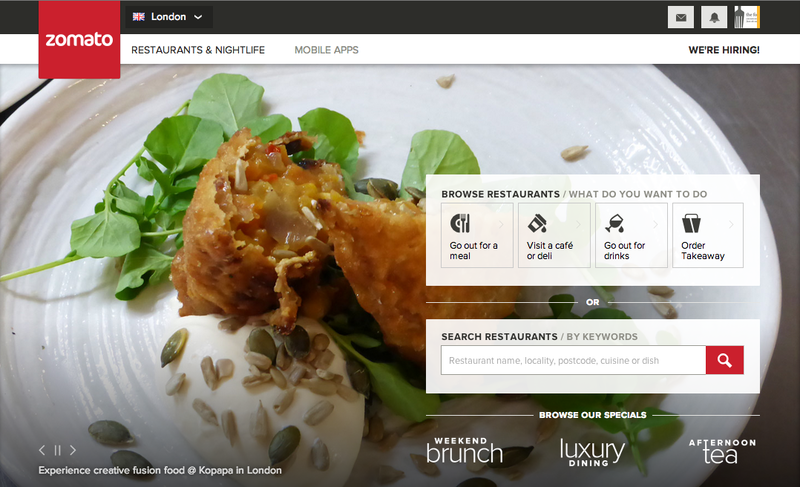 The website and app lets you simply browse by location, cuisine, or name. You can check out menus, pictures, and maps. 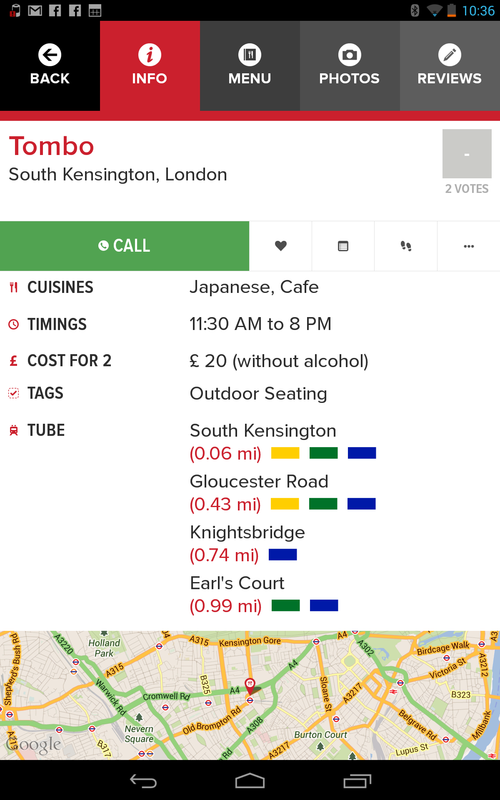 Zomato is present in and covers restaurants in London, Manchester, Birmingham, Manila NCR, Johannesburg, Cape Town, Pretoria, Auckland, Wellington, Dubai, Abu Dhabi, Sharjah, Colombo, Doha, Delhi, Mumbai, Bangalore, Kolkata, Pune, Hyderabad, Chennai, Jaipur, Chandigarh, Ludhiana, Lucknow, Ahmedabad, Indore and Guwahati. Firstly, the GUI design is pretty sleek and sophisticated, on the retina google nexus 7 323-pixel display. The carousal gallery cleverly displays featured restaurants according to your location. The navigation menu system is easy to use, with “search” and “explore” prominent and other sub menus with icons. 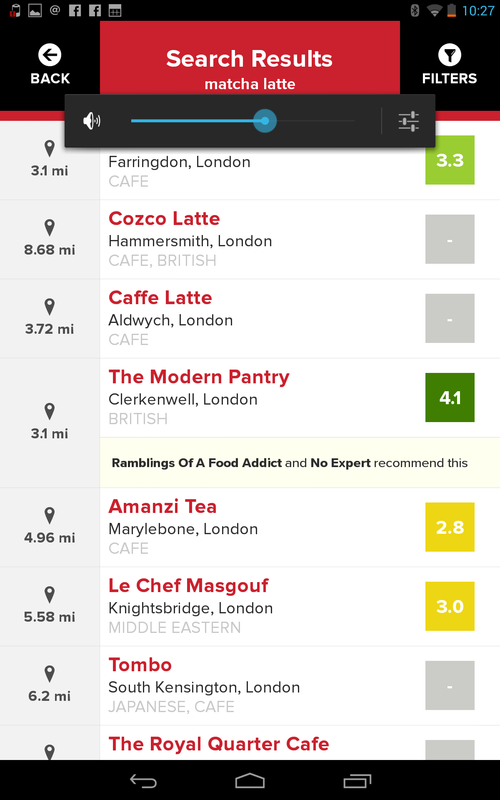 A quick search for “matcha latte” and the app displays a list of places with the item on the menu. Now the downside it shows “EAT” Farringdon as the nearest one to my location. 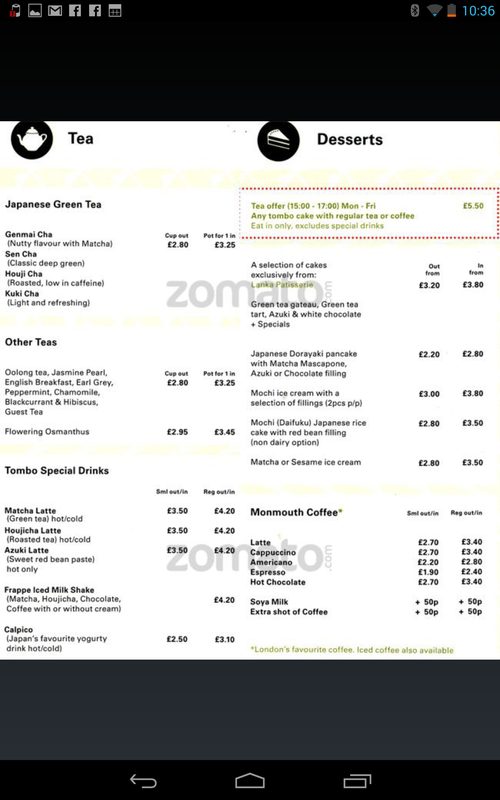 I know Canary Wharf is my local branch, plus I know a lot of places in central London that has matcha latte. The good thing with this search I’ve now found a new place to go, I did not know “The Modern Pantry” served a special Matcha afternoon tea. There goes another one for my to eat list. It also shows up with fellow “foodies” I follow recommend highlighted at the bottom of the listed search. 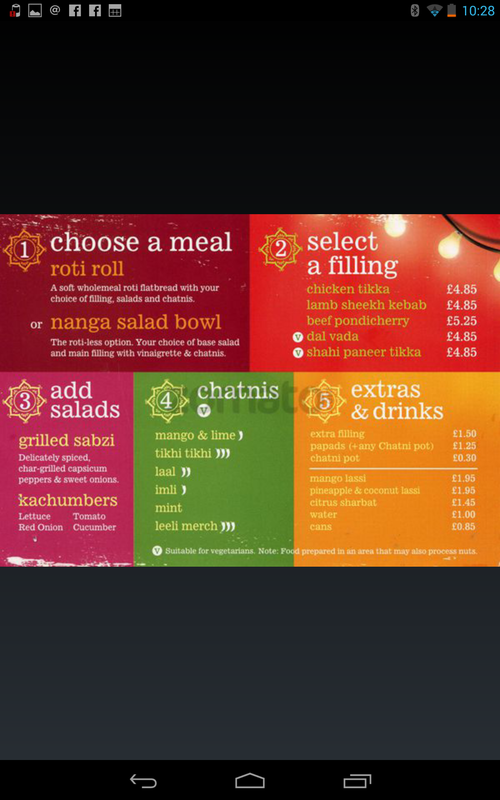 What I love about Zomato is once you click on a place your interested you can view the establishment menu. There’s a map,and nearest tube stations are colour coded and distance from you are. Estimated costs, opening hours and contact details. The Zomato community is user generated, reviews are by real people, and the leadership board is fun and a great way to find recommendations. The explore function helps you discover new places. Overall, Zomato is a great app to discover new places and specific dishes, and I look forward to seeing the new updates they plan to roll out.